A new and enlarged edition of this title which was first published in 2002. This appalling accident took place on 8th October 1952 – 112 people were killed and 167 passengers were taken to hospital for treatment, making it the second most serious railway accident in the United Kingdom. It came about when the overnight sleeping car train from Perth to London Euston in patchy fog overran the signal and collided with the rear of a crowded local train from Tring to Euston standing in Harrow & Wealdstone station. This had no sooner happened, when a double-headed express passenger train from Euston to Liverpool and Manchester ploughed into the wreckage. 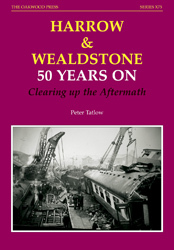 Rather than concentrate on the causes of, and steps taken following the accident to avoid recurrence, this work also looks at the huge task of mounting the rescue operation, managing the disruption to railway operations and clearing up the aftermath. The response of the police, fire and ambulance services, civil defence teams, local community and voluntary organisations, national and local press, churches, as well as the railway authorities are considered, together with the help given by and lessons learned from our allies in the form of the medical teams from the United States Air Force. A5 format, 128 pages, over 60 illustrations.